North Korea has opened a sleek new airport terminal, hailing it as a showcase of leader Kim Jong-Un's achievement after its construction had to be stopped halfway and redone at his whim. 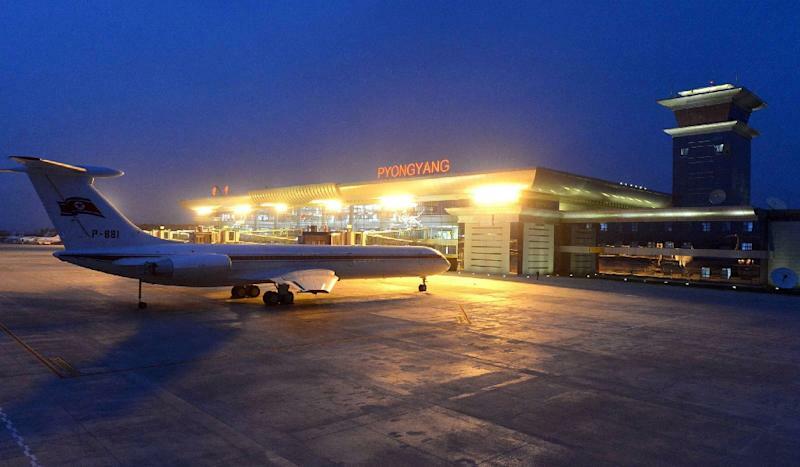 Terminal 2 of Pyongyang International Airport, which is reserved for international civilian flights, opened for service on Wednesday, state media said. "The terminal was built in a modern way from the gatepost to the airport to departure lounge, entry formalities hall, service halls, etc.," the Korean Central News Agency (KCNA) said. Late last year, the country's supreme leader ordered workers to demolish and rebuild portions of the new terminal, after they failed to execute the leadership's architectural vision for the building. Pictures released by KCNA showed a glass-fronted, marble-floored terminal, a far cry from the old, drab socialist-style building. One of the most outstanding differences was the presence of elevated passenger boarding walkways. In the past, travellers had to walk or drive across the tarmac to board their aircraft. The terminal also appears to be fitted out with a coffee bar and a duty-free store stocked with chocolate Mars bars, Werther's Original candy and bottled beers. During the opening ceremony, Prime Minister Pak Pong-Ju credited Kim's "ardent patriotic will and unremitting efforts" for putting the country's aviation sector on "a world level", according to KCNA. Kim took power in 2011 after the death of his father Kim Jong-Il, who was afraid of flying and travelled everywhere by train. But his son, who studied in Switzerland as a teenager, has shown a keen interest in aviation, flying a North Korean-made light plane himself in March, according to a video released by the North. He has issued directives to improve the nation's inflight services and redesign Koryo Air's flight attendant uniforms, after the country's sole civilian airline came in for international mockery. In July 2012, Kim ordered construction of the new terminal because the existing facility was considered too small and shabby compared with foreign rivals. But in November last year, Kim stopped work on the project after inspecting the site. The new terminal had to be partly demolished on Kim's order after he said the layout looked like "a copy" of a foreign facility. 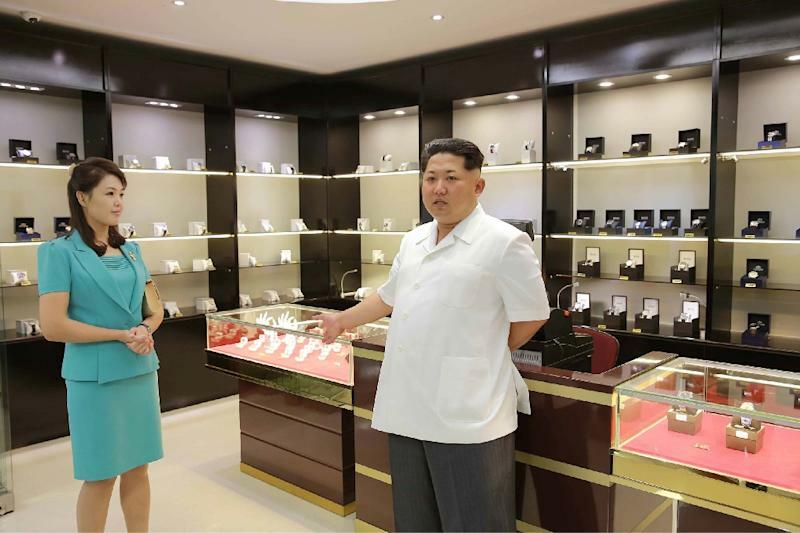 He reproached workers for failing to carry out an earlier order from July that the project should reflect North Korea's "Juche" (self-reliance) philosophy and national identify. Kim said there were "deviations in the interior layout including halls for check-in and departure", KCNA reported last November. Parts of these facilities had to be rebuilt as a result. North Korean architecture is characterised by its monumental but sombre, socialist style that incorporates propaganda symbols of the communist state. With the new terminal in place, the airport's other existing terminal is expected to be used only for the country's few domestic routes. But the facility risks being virtually empty as Pyongyang receives few foreign flights, which mostly originate from Beijing and Moscow. 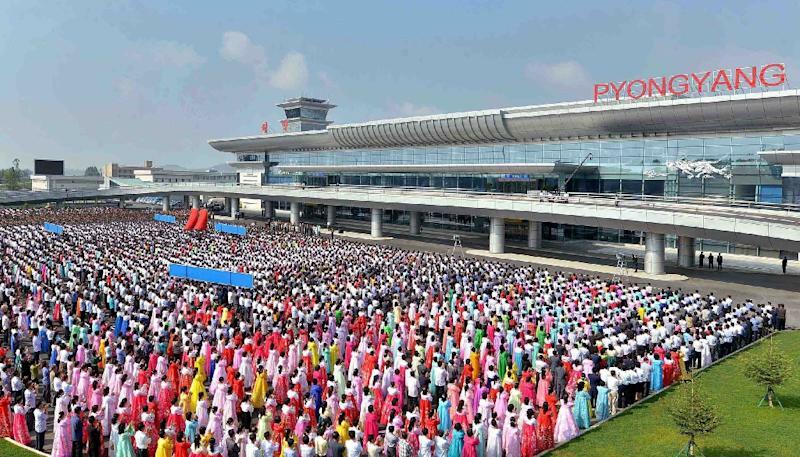 The new terminal is six times larger than the old one, but it remains unclear how North Korea will be able to generate the passenger numbers that would justify its construction. However, the young leader has a penchant for showpiece construction projects. Under his direction, a ski resort, water park and equestrian course have been built, but they are beyond the reach of the average citizen in the impoverished Stalinist state. Since taking power, Kim has mobilised twice as many soldiers as his father, deploying some 200,000 soldiers -- one out of every five active servicemen -- to construction sites nationwide, including the airport terminal, resorts, public buildings and apartments.